Glenn Ligon has always had a preoccupation with the intersectionality of race, gender, and sexuality. Ligon’s two exhibitions What We Said The Last Time and We Need To Wake Up Cause That’s What Time It Is, in which the artist illustrates his engrossment with these subjects, are occurring simultaneously at Luhring Augustine‘s Chelsea and Bushwick locations. What We Said The Last Time features a series of seventeen enlarged prints from the paint-splattered pages of the artist’s well-worn copy James Baldwin’s 1953 essay “Stranger in the Village” from Notes of a Native Son (published 1955). Written during a stay in a small settlement in Switzerland, “Stranger in the Village” examines race as a social construct. “From all available evidence no black man had ever set foot in this tiny Swiss village before I came,” Baldwin writes as he documents his experiences as a gay black man visiting the small Swiss town as a way to better understand the African American identity. Also on view is Entanglements, a curatorial project by Ligon that examines how artists use the studio as a base from which to engage momentous cultural shifts and political events in both direct and oblique ways. 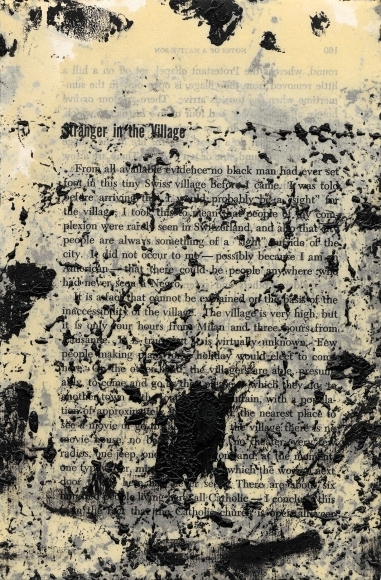 Beginning in 1996, Ligon has used Baldwin’s essay as the basis for his “Stranger” series, which includes prints, drawings, and paintings made from oil slick and occasionally coal dust that nearly obscures the text. While working on this series, Ligon kept copies of Baldwin’s essay on his studio table for reference, and over the years they accumulated a large amount of black paint, oil stains, and fingerprints. This show marks the first time Ligon has used the entirety of Baldwin’s essay in his career. Like so much of Ligon’s work, the resulting prints illustrate the role of intertextuality in contemporary art, and how one medium can simultaneously inform and contradict another. 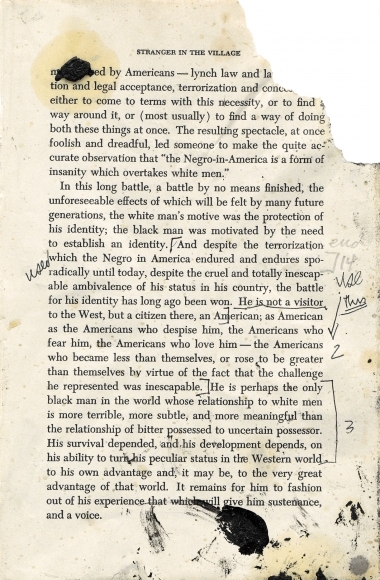 The use of Baldwin’s seminal essay attests to the power of language and ink on paper, but Ligon’s pseudo-redaction of the text tells us something different. One page has the page number and top right corner completely ripped off and thick drops of paint cover sections of the text, but we can still see his quick annotations, contrasting Baldwin’s ruminations with the artist’s own spontaneity. 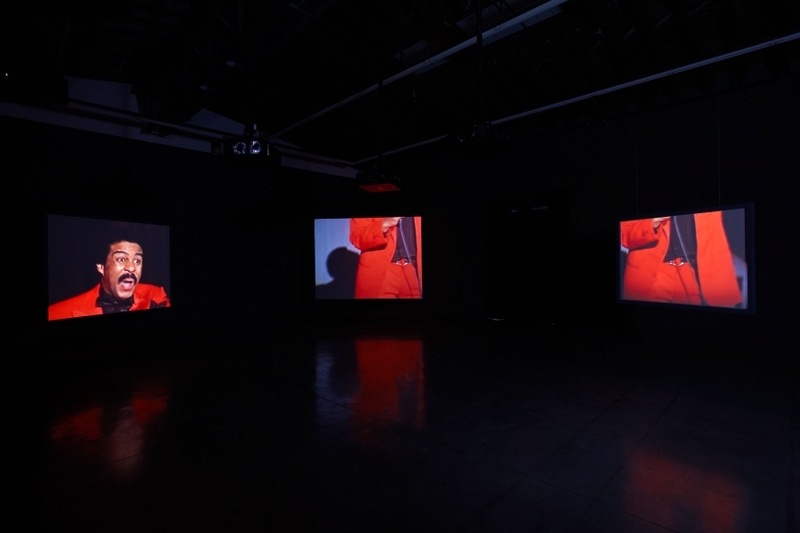 We Need To Wake Up Cause That’s What Time It Is in Bushwick opened January 16 and predominantly features Ligon’s Live (2014), a silent video installation based on the 1982 film Richard Pryor: Live on the Sunset Strip. This is not the first time Mr. Ligon has engaged with Pryor’s work. The artist’s text-based paintings often incorporate references to Pryor’s stand-up, most notably in a series of gold-colored paintings beginning in 1993 based on Pryor’s groundbreaking material from the 1970s. The installation is set up in a circle of six large screens and a smaller screen in a corner. 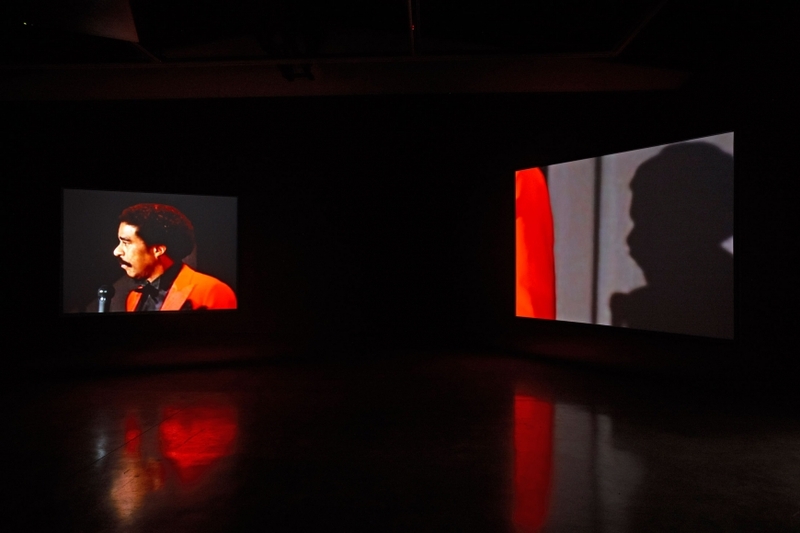 On the smaller screen, we see the unedited version of Pryor’s original performance, while the other screens zoom in on specific parts of Pryor’s body as they appear in the original footage: his head, his shadow, his right hand, his left hand, his mouth, and his groin. 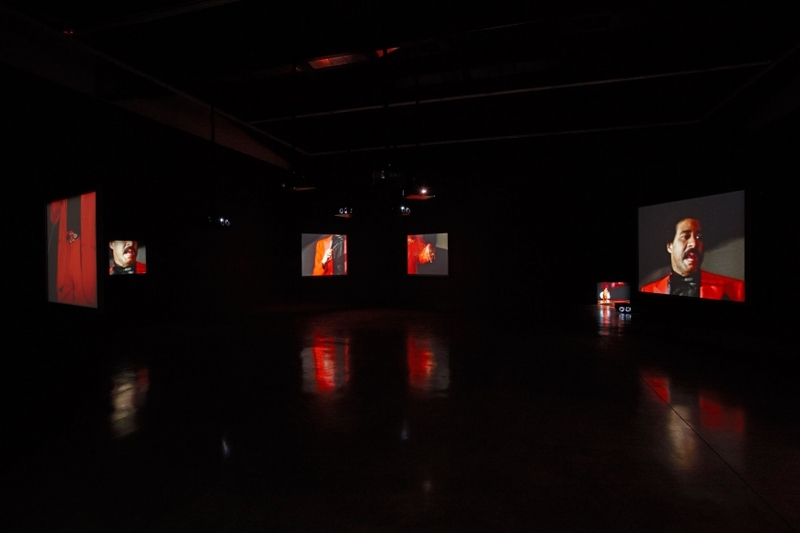 The projected images are visible from both sides of the screen, so the viewer can encircle the installation and almost always be confronted by Pryor’s captivating stage presence. Each screen is illuminated only when their designated body parts appear in the original film, so the screens sporadically flicker on and off as your eyes jump around the room to catch his image. By fragmenting the footage, Pryor’s body parts seems to move independently from the others. His rapid gestures seem second nature to him, but his expression shifts seamlessly between deadpan and animated throughout the film. The lack of audio is particularly jarring when we see Pryor erupt into fits of emotional gestures and cursing. These moments are often followed by brief periods of complete silence and darkness as the camera temporarily leaves the comedian’s body. Ligon, Pryor, and Baldwin all share an obsession with the idea of black masculinity, but by drawing on this idea rather than readily subverting it, all three were able to contrast the narrative of blackness with its reality. By cutting up Pryor’s image and muting his voice, and by blacking out Baldwin’s text, Ligon illuminates their vulnerability. This installation subtly critiques the social constructs of race and masculinity, but also emphasizes the limits of language in expressing ourselves to one another. The artist forces us to contemplate the ways in which we represent ourselves, both voluntarily and unconsciously. Moreover, and perhaps more importantly, he also conveys the fact that to be marginalized either as a group or individually means to be silenced, or to essentially be rendered without language. If we do not have language, how do we communicate? Some say that actions speak louder than words, but it seems that Mr. Ligon does not believe the two should be separated. What We Said The Last Time at Luhring Augustine in Chelsea is on view until April 2, 2016; We Need To Wake Up Cause That’s What Time It Is at Luhring Augustine Bushwick is on view until April 17, 2016.